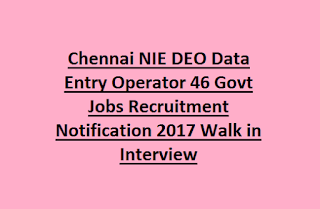 DEO Jobs through an Interview conducted by NIE Chennai on Contract basis. There are total 46 vacancies available in this NIE DEO Jobs Recruitment. Applicants having essential qualifications for these vacancies can attend walk in Interview conducted on 21, 22, 23, 28- February- 2017 and 01, 02- March- 2017. Selection of NIE DEO Jobs Walk in Interview will be based on the performance of the candidates in written test and interview. For Age details, Educational Qualifications, Pay scale, Number of Vacancies, Application procedure and other details of National Institute of Epidemiology NIE DEO Jobs recruitment exam 2017 are mentioned below. 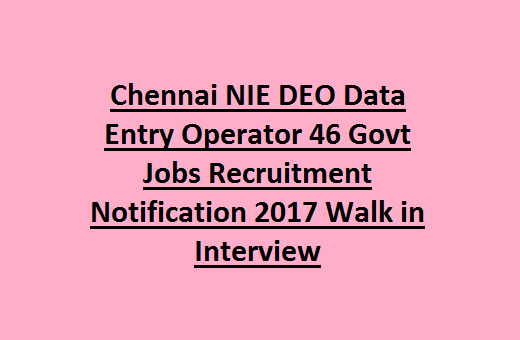 Click here to see the official notification of Chennai NIE DEO Jobs 2017. Walk in Interview dates: 21, 22, 23, 28- February- 2017 and 01, 02- March- 2017. Vacancies available in National Institute of Epidemiology (NIE): 46 posts. 1. Computer Programmer Grade- A (Technical Assistant): 01 (UR) post. 2. Project Technical Officer (Teaching Assistant): 02 posts (UR- 01, OBC- 01). 3. Senior Project Assistant (UDC) (Administrative Assistant): 01 post (OBC). 4. Project Technician-III (Field): 01 (UR) post. Pay scale for the post Data Entry Operator DEO is Approximately Rs.17000 per month. Salary details for other posts see the NIE official Notification. DEO: Candidate must have passed Intermediate or 12th pass from recognized Board. Speed Test: 15000 key depressions per hour through test on computer. Project Technical officer: Must have completed Graduate/ master Degree in Science subjects from a recognized University. For Qualification details of other posts visit NIE official notification. Age limit of the candidate for DEO posts is 25 years for general candidates, For OBC candidates is 28 years and for SC candidates is 30 years. Age details of other posts given in NIE official advertisement. Selection for this National Institute of Epidemiology NIE DEO Jobs recruitment will be based on merit in written test and Interview through direct walk ins. Interview dates: 21, 22, 23, 28- February- 2017 and 01, 02- March- 2017. Candidate should require to bring all original and attested copies of qualification and experience certificates along with application form at the time of interview. Eligible candidates with all required qualifications may walk in for an Interview conducted by NIE. Download the application from National Institute of Epidemiology official website @http://nie.gov.in. Fill the application and carry along with a set of Xerox copies of Educational qualification and Experience certificates at the time of Interview. Ayapakkam, Chennai – 600 077. See the official notification of NIE for more details.